Declaring the surge in child arrivals an “urgent humanitarian situation,” President Obama earlier this month tapped the Federal Emergency Management Administration (FEMA) to lead a coordinated interagency response. With existing children’s shelters at capacity, military installations in California, Oklahoma, and Texas are housing many of these children on a temporary basis, and the federal government plans to open more makeshift facilities in the coming months. The Department of Justice (DOJ) has announced the creation of a $2 million program to help provide legal representation in immigration court to some of these minors—most of whom lack legal representation during their removal hearings. And the Obama administration has requested $1.57 billion in emergency appropriations from Congress to house, feed, process, and transport these children. While the flow of UACs has been climbing steadily since 2012, a dramatic surge has taken place in the last six months, with the Rio Grande Valley in South Texas as the principal place of entry. The Border Patrol there has converted entire stations to house unaccompanied minors and families. 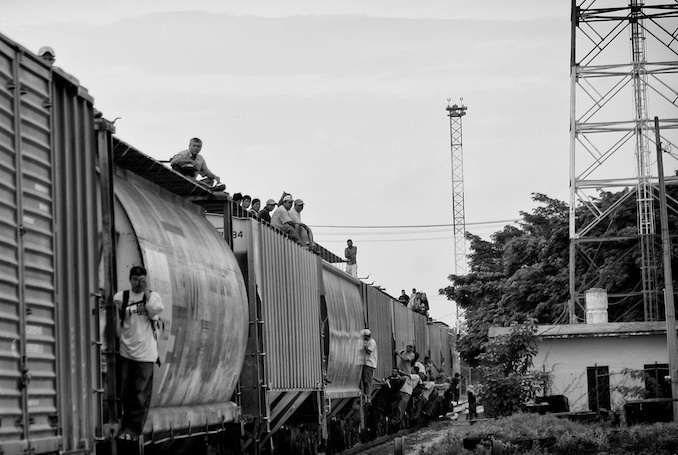 Ninety-eight percent of unaccompanied minors currently arriving at the border are from Honduras (28 percent), Mexico (25 percent), Guatemala (24 percent), and El Salvador (21 percent). This breakdown represents a significant shift: prior to 2012, more than 75 percent of UACs were from Mexico. *FY 2014 data are fiscal year to date, through May 31. Source: U.S. Customs and Border Protection, “Southwest Border Unaccompanied Alien Children,” accessed June 6, 2014, www.cbp.gov/newsroom/stats/southwest-border-unaccompanied-children. Importantly, unaccompanied minors who are Mexican are treated differently than those from countries non-contiguous to the United States: Nearly all Mexican children who are unaccompanied are quickly returned to Mexico. In a significant victory for humanitarian organizations and others who work with unaccompanied minors, Congress in 2008 passed the Trafficking Victims Protection Reauthorization Act (TVPRA). Under TVPRA, children from countries other than Mexico and Canada are transferred by the Border Patrol into the custody of the Office of Refugee Resettlement (ORR), an agency of the U.S. Department of Health and Human Services (HHS) that has been responsible for processing and sheltering certain unaccompanied minors since passage of the Homeland Security Act of 2002. These children are simultaneously placed into removal proceedings with the Executive Office for Immigration Review (EOIR), the administrative immigration court system that is part of DOJ. Ninety percent of these children are released by ORR into the care of a parent, relative, or family friend while they await adjudication of their immigration cases, with foster care the placement for the remainder. TVPRA codified these practices, in addition to requiring U.S. Customs and Border Protection (CBP) to transfer children from non-contiguous countries to ORR custody within 72 hours of determining that a child is an unaccompanied minor. Perhaps TVPRA’s most appreciable change established that the Border Patrol must screen unaccompanied children from contiguous countries (Mexico and Canada) to determine, within 48 hours of the child’s apprehension, that the child is not a trafficking victim, has no claim to asylum, and can voluntarily agree to return to his or her country of origin—in the vast majority of these cases, Mexico. The very small number of Mexican children who trigger one or more of these concerns is transferred to ORR and subject to the same process as those from non-contiguous countries. Prior to passage of TVPRA, unaccompanied minors from Mexico were generally automatically given voluntary return without inquiry into the circumstances of their departure or claims to relief under U.S. law. The number of unaccompanied minors who remain in the United States permanently is not known. An immigration judge can ultimately order such children removed, grant them voluntary return, relief, or administratively close the case (meaning it is taken off the court docket so deportation is temporarily stopped, but no legal status or immigrant benefits are conferred). Those granted relief are typically given asylum, Special Immigrant Juvenile (SIJ) status (for children who can establish in a state juvenile court that they were abused, neglected, or abandoned by one or both parents), a U or T visa (where the Department of Homeland Security determines that children were victims of certain crimes or human trafficking). Additionally, according to Kids In Need of Defense (KIND), an estimated 30 percent of unaccompanied minors are ordered removed in absentia because they fail to appear at their initial or later hearings. The Vera Institute of Justice estimates 40 percent of unaccompanied children are potentially eligible for relief. There are deep root causes for this child migration, and for the recent surge in arrivals. While there is consensus that there are significant push and pull factors at work, there is not agreement as to which are more important. And inevitably, the issue of unaccompanied child migration has become ensnared in the broader political fight over immigration reform. In reality, there is no single cause. Instead, a confluence of different pull and push factors has contributed to the upsurge. Recent U.S. policies toward unaccompanied children, faltering economies and rising crime and gang activity in Central American countries, the desire for family reunification, and changing operations of smuggling networks have all converged. There is some evidence of a growing perception among Central Americans that the U.S. government’s treatment of minors, as well as minors traveling in family units, has softened in recent years. These child-friendly policies in many ways directly flow from TVPRA. In addition to the screening and ORR transfer requirements described above, the law also requires the United States to ensure safe repatriation of minors and established standards for custody, created more child-friendly asylum procedures, and relaxed eligibility for SIJ visa status. Some also contend that minors are spurred to migrate by the false idea that they could benefit under the Obama administration’s Deferred Action for Childhood Arrivals (DACA) program, which offers a reprieve from deportation for certain young unauthorized immigrants who have lived in the United States since 2007. Furthermore, while these minors are all placed in removal proceedings, it is not clear that they are ultimately repatriated to their home countries. According to U.S. Immigration and Customs Enforcement (ICE) data, the agency carried out 496 repatriations (removals and returns) of juveniles from Guatemala, Honduras, and El Salvador in 2013, down from 2,311 in 2008. On the other hand, strong evidence also points to increasingly grave conditions in Central America as principal drivers of the new influx. A number of investigations by journalists and studies by nongovernmental organizations have found that children are fleeing their home countries to escape violence, abuse, persecution, trafficking, and economic deprivation. To be sure, murder, poverty, and youth unemployment rates paint a bleak picture of conditions that children may face in Honduras, Guatemala, and El Salvador in particular. Rising gang violence in some of these countries has become an undeniable factor in many children’s decision to migrate. A recent UN High Commissioner for Refugees (UNHCR) study based on interviews with more than 400 unaccompanied minors found that 48 percent had experienced violence or threats by organized-crime groups, including gangs, or drug cartels, or by state actors in their home countries, and 22 percent reported experiencing abuse at home and violence at the hands of their caretakers. Thirty-nine percent of Mexican children reported being recruited into or exploited by human smuggling organizations. Additionally, family separation has long been a strong motivation for unaccompanied minors to migrate. Immigration to the United States from Central America and Mexico in high numbers over the last decade has led adults, now settled in the United States, to send for the children they left behind. UNHCR researchers found that 81 percent of the children they interviewed cited joining a family member or pursuing better opportunities as a reason for migrating to the United States. While the family separation dynamic is not a new one, home-county conditions have added urgency to it. Lastly, stronger, more sophisticated smuggling infrastructure and networks are surely playing a role in facilitating the rise in children’s attempts to cross the border by themselves. Whatever mix of factors has triggered the surge, there is universal concern about the harrowing journey that children endure as they travel north. These children are frequently trafficked, robbed, sexually assaulted, and exploited by a host of bad actors including their smugglers, traffickers, gangs, cartels, and even government authorities. The well-documented horrific experiences many child migrants encounter during their passage north have raised alarm about the need to address the emerging crisis. The complexity of factors contributing to this crisis, however, does not lend itself to a quick fix or a lasting solution. In the immediate term, advocates have called for a buildup of space and capacity to care for the children, improved screening and expedited processing to identify and protect children who would be truly in danger if returned to their home countries; adjudication in home-country protected areas of the claims of children who might have standing for humanitarian protection in the United States; improved access to legal counsel in U.S. courtrooms; improved training to sensitize government personnel who come in to contact with children; and collaboration with countries of origin on safe and sustainable return. Others are calling for more swift repatriation of children who do not have claims to remain in the United States, in addition to increased law enforcement efforts aimed at disrupting smuggling networks. In the mid-term, solutions include expanded legal avenues for children to be reunited with their families in the United States, and recognition of internationally shared obligations to protect those who cannot be reunited. Ultimately, only improved national and regional economic and security conditions in the children’s countries of origin can stem the flow. All of these solutions—whether immediate, mid, or long term—are uphill battles that are costly to undertake and politically difficult to execute. Obama Administration Extends Deferred Action. On June 5, 2014, Homeland Security Secretary Jeh Johnson announced the process for renewing enrollment in the Deferred Action for Childhood Arrivals (DACA) program. To qualify for DACA renewal, individuals who met the initial criteria must establish that they have continuously resided in the United States since applying for DACA successfully, have not departed the United States on or after Aug. 15, 2012 without obtaining advance parole; and have not been convicted of a felony, significant misdemeanor, or three or more misdemeanors or otherwise pose a threat to public safety or national security. U.S. Citizenship and Immigration Services (USCIS) will not require evidence or information about applicants’ continued enrollment in educational programs or graduation, a requirement for an initial DACA grant. USCIS has issued an updated application (Form I-821D) to be used for both renewals and initial requests. It began accepting renewal applications effective immediately, and has advised applicants to submit their forms four months before their DACA status expires (applications submitted more than 150 days before expiration may be rejected and returned by USCIS). The application fee will remain at $465. As of February 2014, USCIS had approved 521,815 DACA applications. The DACA program was announced by the Obama administration in June 2012 and offers protection from deportation (in the form of deferred action) and work authorization to certain young unauthorized immigrants who came to the United States at a young age, are enrolled in or graduated from school, and pass a background check. Obama Administration to Offer Work Authorization to Spouses of H-1B Workers in Line to Receive Permanent Residency. On May 6, the Departments of Homeland Security and Commerce announced two proposed rules aimed at attracting and retaining highly skilled immigrants. The first extends employment authorization to spouses (in H-4 status) of H-1B workers whose petition for a grant of permanent residence through their employment (e.g. a green card) is pending adjudication. The second proposal streamlines work authorization procedures for certain nonimmigrants from Chile and Singapore (in H-1B1 status), Australia (in E-3 status), and the Commonwealth of the Northern Mariana Islands (in CW-1 status). It also expands evidentiary criteria for individuals applying for green cards through the employment-based first preference (EB-1) category for outstanding professors and researchers. According to U.S. Commerce Secretary Penny Pritzker, the two proposed rule changes “are an integral part of the administration’s efforts to strengthen entrepreneurship and innovation, and to help the United States attract and retain highly skilled immigrants.” Sen. Charles Grassley (R-IA) dismissed the rules changes as demonstrating a lack of compassion toward unemployed U.S. workers and a circumvention of congressional authority. The proposed rules, published in the Federal Register on May 12, 2014, are open for a 90-day period of public comment before the final rules are published and go into effect. CBP Issues New Use of Force Report, Policies. In May, U.S. Customs and Border Protection (CBP) issued a revised use of force policy, guidelines and procedures handbook alongside an independent study of Border Patrol use of force cases and policies conducted by the Police Executive Research Forum (PERF). Both publications were released amid mounting pressure on CBP to improve its transparency and use of force practices. The updated guidelines clarify and tighten circumstances in which agents are permitted to use deadly force and firearms, require agents to issue verbal warnings prior to using force, strengthen use of force training, and provide for more use of non- or less- lethal devices. Supreme Court rules on immigrants who “age out” of visa line. On June 9, the Supreme Court ruled in Scialabba v. Cuellar de Osorio that unmarried children who are included in their parents’ application for lawful permanent residence—and who turn 21 while their application is pending—lose their place in line and have to refile. At issue was whether the Child Protection Status Act (CPSA), passed by Congress in 2002, affords protection from being “aged out” for all or only some children. In a 5-4 decision that produced unusual voting blocs and five separate opinions, the justices reversed a Ninth U.S. Circuit Court of Appeals ruling in the case (then named Mayorkas v. Cuellar de Osorio) and sided with the Obama administration, which argued in favor of a prior Board of Immigration Appeals decision in the case Matter of Wang. Under the BIA’s interpretation, the CPSA law only applies to “aged-out” individuals when they qualify as principal beneficiaries of a visa petition, not as derivative beneficiaries. The government estimates that several thousand children awaiting visas turn 21 each year. Obama Administration Delays Enforcement Review, Announces and Delays Military Plan. On May 27, President Obama asked Homeland Security Secretary Jeh Johnson to delay announcing the results of a review of DHS immigration enforcement policies ordered in March. The goal of the review—announced in response to criticism from immigration advocates over the administration’s deportation record—is to identify and implement ways to allow individuals with strong equities to stay in the United States and minimize family separation. Several days later, on June 2, the White House announced it would delay a plan the Pentagon announced in late May to allow certain young unauthorized immigrants with grants of deferred action under the DACA program to enlist in the military. According to the White House, both delays were designed to keep the focus on legislative reform in the waning days of the congressional calendar. House Republicans leaders, who say they are not willing to move on immigration reform because President Obama cannot be trusted to enforce the law, have shown no indication that the delays have changed their calculus. District Court Rules that TPS Grantees are Deemed Inspected and Admitted. On May 30, the U.S. District Court for the Western District of Washington ruled that a noncitizen’s grant of Temporary Protected Status (TPS) qualifies as inspection and admission for purposes of adjustment of status to lawful permanent residence in the United States. The court held that U.S. immigration law provides a pathway for a TPS beneficiary to obtain a green card, and adopts a June 2013 U.S. Appeals Court for the 6th Circuit ruling that TPS holders who entered the United States without inspection are eligible to adjust to LPR status without departing the country first. Spate of Localities Drop Detainer Policies after Court Ruling in Oregon. In recent weeks, dozens of counties in California (including Los Angeles, San Diego, Riverside, San Bernardino, and Napa), Washington (including Walla Walla, Kitsap, and Thurston), Colorado (including Denver, Boulder, Mesa, and San Miguel) and 29 in Oregon have stopped complying with federal immigration holds, also known as ICE detainers. The changes spread following an April 2014 Oregon federal court ruling that found that Clackamas Country had violated the constitutional rights of Maria Miranda-Olivares, the plaintiff in the case, by keeping her in custody more than 48 hours beyond the time she would have otherwise been released, based on an ICE detainer. The judge also found the county liable for damages and held that complying with federal immigration detainers is not mandatory for local law enforcement agencies. ICE detainers are requests to local law enforcement authorities to hold an arrestee until ICE can take them into custody.